Hi , I would like to know the item code for roll paper for a Designjet 111 printer? I think it's 120 gr 2" 7mm x 40 but I don't know the code? Best regards, Khalil. Hi, can these HP Designjet 111 cartridges be refilled? We don't sell a refill kit for the HP Designjet 111 610mm printer. Therefore, we don't recommend that you refill these cartridges yourself. Ideal for businesses looking for a budget-friendly large format inkjet, the HP Designjet 111 610mm offers quality printing at the most affordable rates. Print quality is consistent and print speeds are respectable at 90 seconds per page. It is also very compact, as it is significantly smaller than many competing devices. The HP Designjet 111 610mm large-format inkjet printer even has a roller feed option for easier loading of media. However, many find manual feeding of paper very impractical when the roller is not attached. 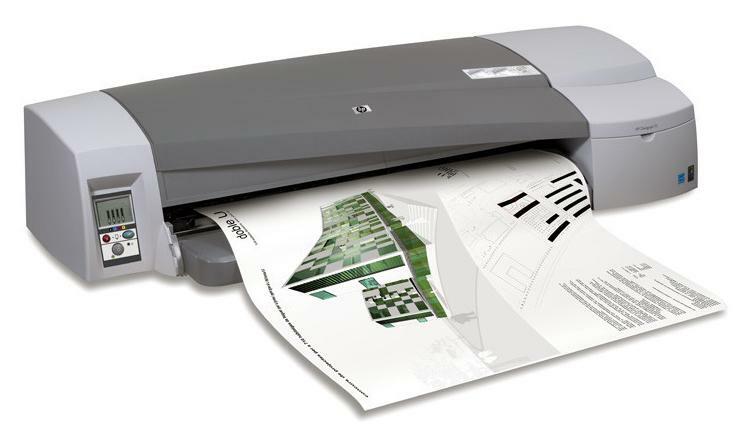 The HP Designjet 111 610mm inkjet printer has a sleek design, measuring only 3.3 feet at its largest area. This means the Designjet 111 610mm printer takes up less space even when used as a desktop unit. The optional paper roller can store roll media as wide as 24.6 inches, but it also supports smaller media, when needed. The HP Designjet 111 610mm is a thermal inkjet printer that uses a high yield black Designjet 111 ink cartridge to help reduce printing costs. Print quality is one of the best highlights of the HP Designjet 111 610mm large-format printer. The HP Designjet 111 can also spit out prints in as fast as 90 seconds per standard large-format page, plus its optional paper roller makes feeding paper into the unit a lot easier. The original HP Designjet 111 610mm colour ink cartridges are very reasonably priced considering that each cartridge is capable of printing at least 2,000 pages. Manual feeding of paper seems to be a common complaint among users. The Hewlett Packard Designjet 111 610mm colour printer does not have a very good paper feed system without the optional roller, which makes printing on large-format media very inconvenient as paper will have to be fed by hand into the printer.